“I’m Lella, nice to meet you.” More of an interactive visual novel than a game, Wheels of Aurelia sees you take the road less travelled in what Santa Ragione promises will be a thought-provoking road trip along the western coast of Italy. In wanting to challenge how their country is stereotypically perceived as idyllic, the developer researched the cultural and historical events that happened in the 1970’s. The visual novel’s creation has not only allowed them to learn more about this tumultuous time period that their parents had lived through, but, they hope in turn, provides the chance for the player’s introspection and to reflect on the world today and how much, or little, has changed since then. That sounds highbrow enough, meaning that it won’t come as a surprise, then, that your conversations in Wheels of Aurelia will soon turn to politics, religion, and other alarming or meaningful topics, interspersed with the often lighthearted discussions that you have with hitchhikers that the player can choose to help out as they drive along the Via Aurelia. As the strong-willed and fiercely independent Lella, this is a game that’s experience is built around the conversations that you have as you drive. With the player repeatedly prompted with a black speech bubble as these discussions continue, you have several seconds to choose what response Lella will make from pre-selected options, and, based on your choices, you will be led to one of sixteen different endings. My first road trip saw me pick up a Juventus supporter that worked at a car factory in Turin, lose a road race that resulted in having to chuck my car keys to the boastful victor only to have a passing hippy come to the rescue by giving me his camper van, learnt that Lella was once kidnapped and now seeks to rekindle the relationship with her saviour, and then raced to the hospital when Lella’s friend suddenly felt faint – which was more worrisome as she’d revealed that she was pregnant earlier in the car ride. These interactions help to make Wheels of Aurelia feel distinctly different to anything else that you will have played in a long while – the conversations being intellectual but never lacking humour, and your surroundings minimalistic but never lacking something to divert your gaze. The problem it has is that the player always feels little more than a passenger on this road trip. Your car automatically follows the road to let you concentrate on the meandering conversations that can often fleetingly switch between topics, but you can choose to hold the B button to push on the accelerator and use the Left Stick to steer the car. This is useful for overtaking other cars that are driving slowly or when racing against the brattish driver that I came across, but, broadly speaking, it is a redundant component that detracts rather than adds to the whole experience. Hitting other cars has no consequence nor the guard rails that ensure that you continue forever onward, that means that the only meaningful interaction that you ever have is when you choose whether to turn off at an intersection in the road or not to detour from your route. Away from these limited moments, it’s simpler to let the game handle the driving meaning that you’re left to solely converse which, in turn, hampered how engaged I really was with it all – especially when the conclusion of each road trip felt so unfulfilling. With each journey lasting around 15 minutes, even the thought of trying to work out how to reach each of the game’s endings wasn’t an appealing one. 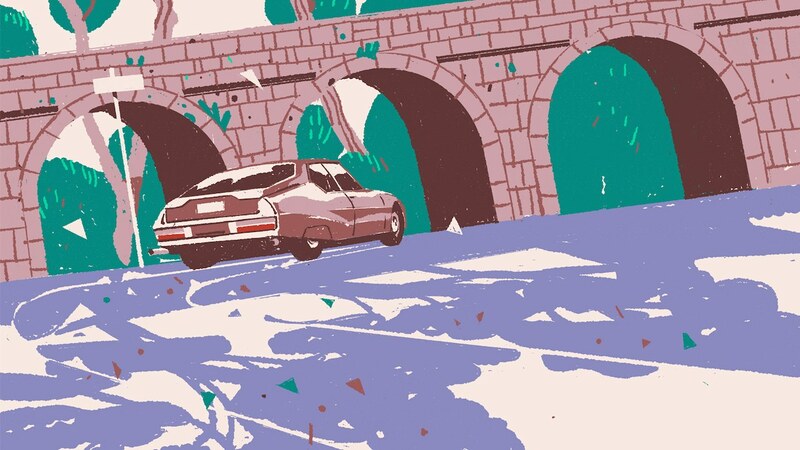 Wheels of Aurelia is about the road trip not the destination, we’re told. Santa Ragione should feel proud of their efforts to bring to light stories and events in Italy’s history, in educating a generation that may well be less aware of them. I’m just not certain that this was the best way to impart what they learned.